Ava's latest quirk is that she likes to dress herself. She is extremely adamant about doing it completely on her own and gets quite angry if anyone so much as attempts to help her. What's worse is that she also likes to choose her own outfits. Every morning she selects from her wardrobe something to wear that is even odder than what she wore the day before. Often changing outfits several times a day, she will rummage through her closet and drawers picking out articles of clothing (both old and new) until she concocts the strangest ensemble you've ever seen. Here she is wearing one of her 6-month dresses as a shirt over top of some pajama pants and her favorite Little Mermaid socks. She has accessorized with a baby bib, sunglasses, and an infant hat. Sometimes she even refuses to change into something more presentable before leaving the house, forcing us to take her out in public looking like Drop Dead Fred's kid sister. On the bright side, her zany outfits tend to bring out her wild and crazy side. Just take this video for example. 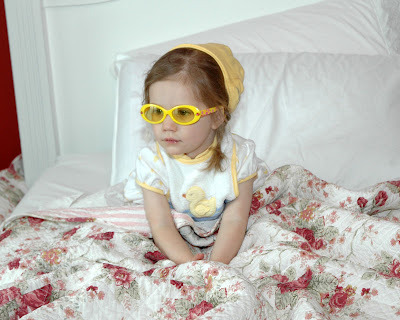 What a little fashonista wearing yellow shaded sunglasses indoors. She seems to be quite a pro at backwards walking. I liked the glimpse of your living room without the entertainment center. I had been curious about that. Now you'll have to sneak in some footage of your furnished basement. I love that she already has her own sense of style---and you've got to hand it to her, she has coordinated the whole yellow/duck thing quite nicely!